When you go browsing through homeware shops and online stores you come across a vast array of wallpaper designs to choose from. It can be a difficult decision to make as you find various so many that you like. It is actually interesting to look around as you find so much more diversity in the range of choices than you think is available. One thing that caught my eye was a collection of striped wallpaper I stumbled upon. I was drawn to the busy pattern that just looked really cool! When you analyse the design there are definitely some pros and cons to this bold choice. The first one that came straight to my mind is that it just looks awesome! 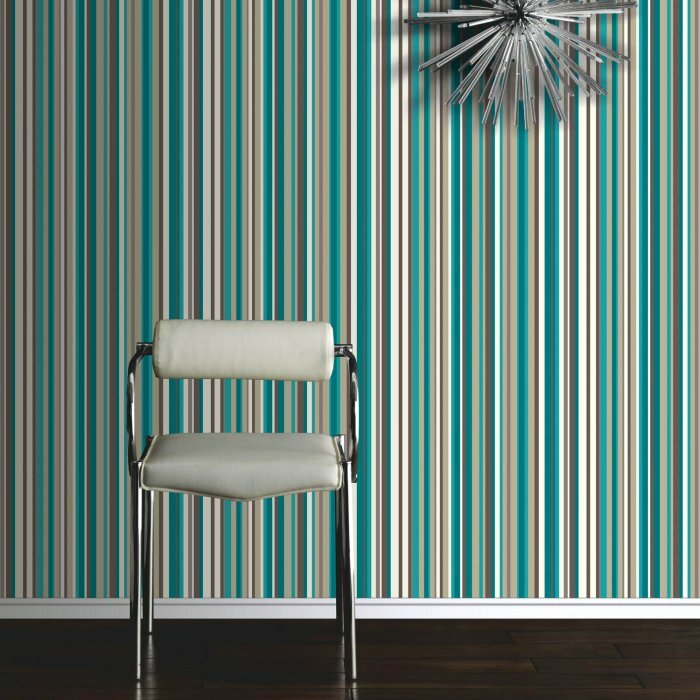 How many peoples homes do you enter and see stripy wallpaper? Not many is the answer for me as I have honestly never seen it before. It just screams out look and me and would create a fantastic statement feature wall within a modern looking living room. The next is the number of colour combination that it comes in. Choosing wallpaper that blandly features one block or shades of that same colour is an obvious choice and doesn’t help out as much when it comes to picking furnishings. I came across a teal, brown and beige combo that looks fantastic and you can use these three colours for everything else. Any girl will know that horizontal stripes are not always the most flattering design when it comes to picking out a top or dress and it can make you look wider. What might be a negative in ladies fashion is a positive within interior design! The horizontal stripes will make the room appear wider than it actually is, great for expanding the room without hiring builders to knock down walls. Vertical will of course make the room feel as though you have higher ceilings, so plus points with both ways you choose! The two different ways to hang striped wallpaper have a positive but this can also turn into a negative. If you are decorating within a small space, placing bold and overpowering horizontal stripes will not make the room look wider. It will make it appear cramped and even dark depending on the colours you use. If you are fortunate enough to have a large house, choosing thin stripes that have a barcode like effect will be too busy across a large wall. You may regret it every time you walk into the room and your eyes feel dazzled! After weighing up which room in your home you want them to go in and working out the design you want, it is safe to say that stripes look great and guests coming into your home will be impressed.